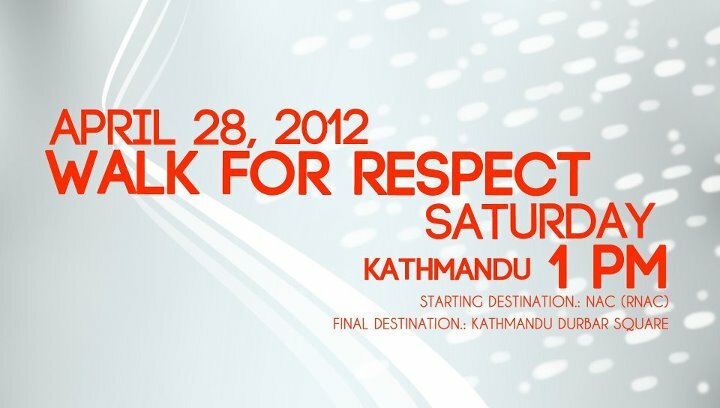 It was just three weeks ago most probably March 29, 2012, one of the Walk for Respect initiators for Nepal Deepshikha Adhikari shared a link with her status as Don't blame me!!!!!!! In fact Men are PERVERT!!!!!!!!!! And it was then all these young people started for a movement that indeed had to be started by someone or other WALK FOR RESPECT. Prakrit Nepal, one of the initiators, shares that a facebook group was created and in 3 days 1400 members had already joined and by the time this article was posted more than 3,111 members had joined and even started raising their voices and that was for sure an overwhelming response for everyone. Though they had named this movement as "Slutwalk" as universally called but later as with suggestions coming in they wanted it to be a priority issue for everyone along with they wanted the issues against "Eve teasing" and "Sexual Harassment" be raised and they had it “WALK FOR RESPECT”. Deepshika shares that we aren't awaring people on sexual harassment or eve teasing occurs. We are awaring about the laws. Srijan Pandey, one of the other initiators, shares "We as educated youth weren't aware about the laws and now we are. And we are awaring about the consequences to the victim and how they can act on this and people are looking for solutions"
To sensitize the greater problem among youths as well as other people i.e. 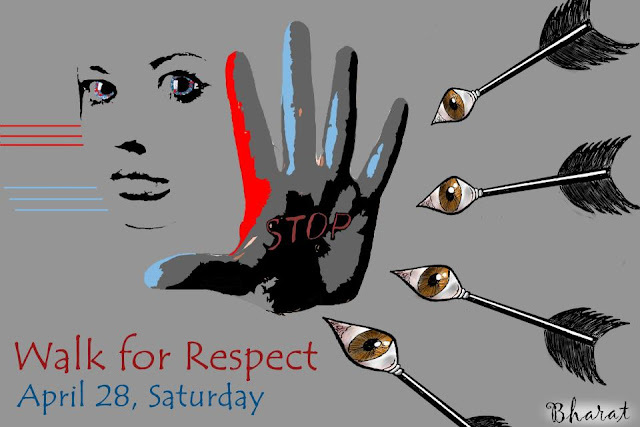 eve teasing and sexual harassment. Gather public support to force the government to take necessary steps in these issues. Warn the culprits that their misbehavior are illegal and they can be punished for their misdeeds. "Whether we are doing it or not ?" "Whether we are really sensitizing this issue or not ?" In context to Nepal, there isn't a strong case being filed by any victim so far. We are the one who can really act on it. We should start from ourselves. Ravi Prakash Vyas, a lawyer from India, shares if there is any situation when a person is victimized its mostly the public who must respond to it and support the person. This not just strengthens the victim but also supports the case of the victim. Regarding on the law from India one of the section says that an offence -song, naming to a person can charge a file on case that leads to a minimum of 3 months in imprisonment. He indicated that in such situations a person gets victimized mentally and psychologically and if there is an injury can lead to minimum of 2 years imprisonment. He shared that the statistics shows there is 2 lakhs 50 thousand cases filed on sexual harrasment in India itself. He also adds that Delhi though has developed a lot but is also regarded to be the most unsafe city. 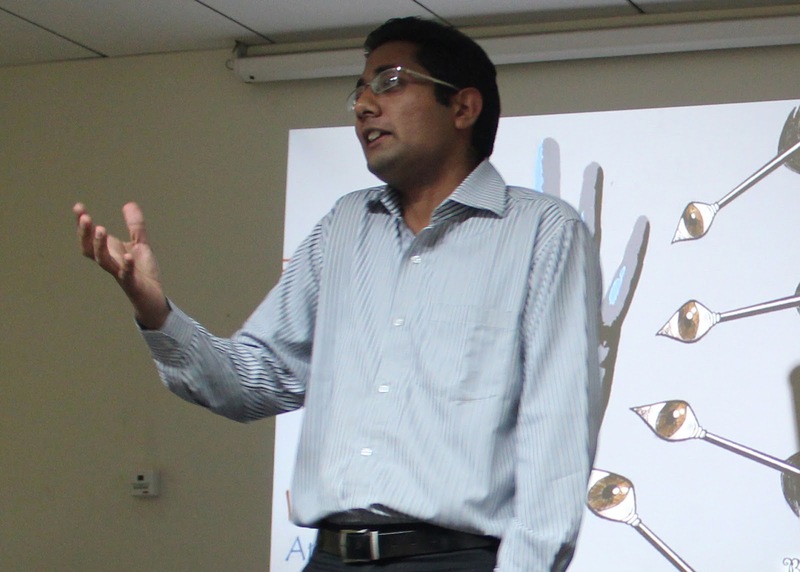 Gaurav Kandel loves to write more on development stories and more particularly on social issues. He too writes on travel and science .